How wonderful is this! The Alberta Union of Provincial Employees (AUPE) has launched an email campaign in defense of postsecondary education in Alberta. There have been a lot of distractions with the developments in postsecondary education since the Government’s budget speech of March 7th, but the simple fact remains: the Government’s cuts of $147 million to Alberta’s 26 postsecondary institutions are on a scale seen only twice before in Alberta’s history, and they make no sense for Canada’s richest province. They make especially little sense at a time in world history where an increasingly complex globe requires that as many of us as possible be thinking and researching our way towards solving local and global problems while equipping this generation of Albertans to play powerful, shaping roles in the twenty-first century. As the University’s Provost noted in an interview with University Affairs earlier in the week, other countries (Asian countries, especially) are making heavy investments in postsecondary education. The Government of Alberta needs to invest in, not cut, postsecondary education in Alberta. To participate in AUPE’s campaign, go to albertapostsecondary.com. 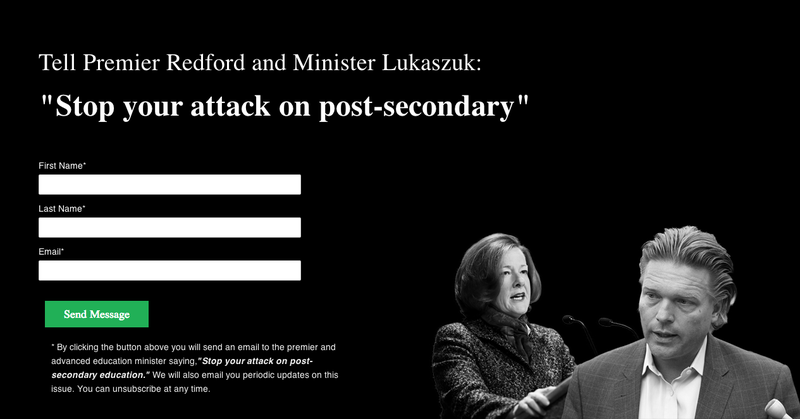 This entry was posted in Uncategorized and tagged alberta postsecondary education, alison redford, aupe, aupe "stop the attack on postsecondary", government of alberta, thomas lukaszuk. Bookmark the permalink. Interesting that I found this so far after the publication. May 13 was my lay-off date. Is there a conversation on this subject somewhere? What I find interesting is previous publicity on Alberta needing skilled and willing people to move to high priced isolated locations only to abandon them on some crazy whim. Good money or not, an unstable employment environment is not one that highly trained people will give up stability for. Even if that stability is underpaid, it beats the cowboy economics of a temporary work camp–did that when I was kid and lived out of the back of a van and not a $400,000 house in some backwater without even a bookstore.